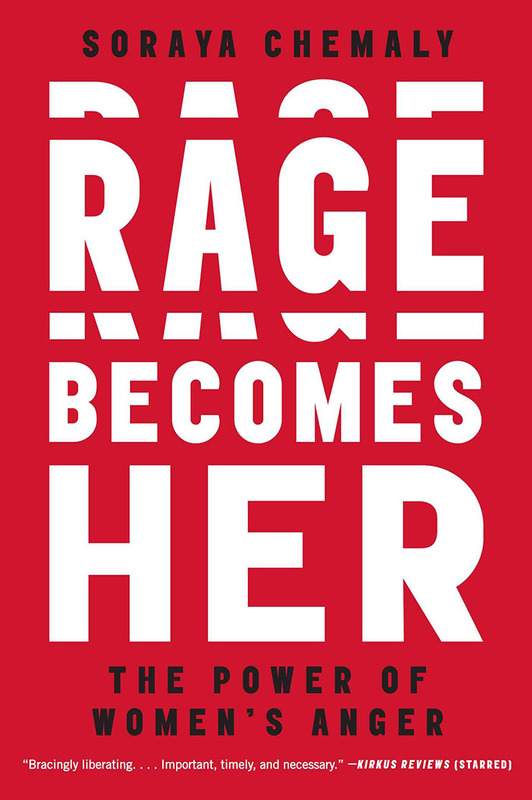 Award -winning writer and activist, Soraya Chemaly, whose articles have appeared in The Nation, Huffpost and The Atlantic offers an in-depth analysis of women’s rage in her new book Rage Becomes Her: The Power of Women’s Anger. What makes women angry, how do we raise girls and boys to express anger differently, what are the psychological, physical, and social consequences of women’s anger, and how might women use anger positively? The book explores these questions with insight, passion, and plenty of research and analyses. Organized into 10 chapters, the book begins with an anecdote from the author’s childhood where she watched her generally calm and collected mother fling her best china dishes methodically and thus got her first glimpse into an angry woman’s self-expression. Chemaly goes on to describe women’s anger and how most of us learn to repress it or self-silence and are never taught how to express anger healthily. She goes on to demonstrate how very young children, as early as pre-school, are raised in such ways as to allow young boys to be aggressive and young girls to be reasonable and accepting when faced with boys’ aggression. Basing her argument on an experience with her own daughter in pre-school, Chemaly develops in the first nine chapters as a means to provide a comprehensive examination of gendered social structures and the persistence of gender-based discrimination which results in significant anger repression. She explores motherhood and its inherent inequalities, how everyday sexism erodes a woman’s self-esteem and leads to anger repression and the #Me Too movement among other topics. Deeply researched and sweeping over a range of issues, Chemaly documents how women (and most of her examples are focused on the U.S., although she does touch on other countries occasionally) are victims of a deep-seated system of discrimination that is persistent despite several decades of feminism and work toward gender equality. The final chapter offers 10 different steps to use one’s rage positively to effect personal and social change. While this book is important for its aggregation of studies and commentaries and pulling together a comprehensive explanation of gender inequities, it also has some limitations. For one, the term “woman” is used often in a monolithic way, although she does acknowledge that women’s experiences differ across racial and class lines. There is a gesture toward intersectional feminism but instead of a clear analysis of how race, class, gender, sexuality create intersecting oppressions, Chemaly mostly adds on the experiences of women of color to a general discussion of women. The book also seems uncritically wedded to gender binaries with “women” and “men” becoming monolithic and constantly opposed categories. Men of color (say, young black men) also cannot express rage or seem hostile without risking their lives, and so to write just about women’s rage seems a bit naïve—a rigorous intersectional framework would have made a significant difference to this book. Secondly, there is so much analysis of how women are victimized (nine chapters) but not enough emphasis on women’s resistance. An occasional reference to issues such as the Women’s March seems rather inconsequential when the reader experiences a barrage of information telling her why she is angry and how such anger needs to be harnessed for positive change. Finally, this is a quibble about the editorial decisions the publisher has made to document the vast body of research the author uses. This is a well-researched book and if a reader wants to find a specific study the author references, she will not find any convenient footnote numbers; instead you flip to the back of the book to 64 pages of notes organized by chapter and page number. The problem is that there are several notes to a page (six on page 32 for example) and no way to distinguish between them. It seems the editor/publisher is trying very hard to repress the scholarly underpinnings of this book and that is irksome and makes the book difficult to navigate. The book is written for a general female American audience and many may find this book informative. For those who are well-read in gender, sexuality, and feminist issues not all the ideas in here are particularly new. Soraya Chemaly presents at Seattle Arts and Lectures on Jan 31 at 7:30 PM.